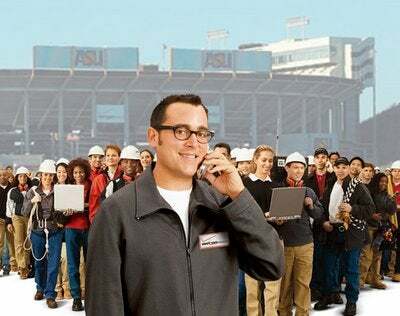 Hey, Verizon dude. Yes, I can hear you now. Thank you for asking. I did it. I pulled the trigger and made the switch from AT&T to Verizon. But as impressed as I am with Verizon so far, I still find the whole situation with AT&T that led to my terminating our relationship both frustrating and disturbing. The signal on my iPhone 4S is significantly better with Verizon than with AT&T. I had been an AT&T customer for more than seven years. I generally found the service to be adequate, and never subscribed to the general AT&T bashing that seems to go on. The AT&T network certainly has weak spots and even the occasional dead zone, but so do other providers. No carrier is perfect. However, for reasons unknown to me, the AT&T network in my area has been getting steadily worse. There have been a couple of weak spots in the same location for years. But AT&T, rather than improving and eliminating those weak spots, allowed them to became dead zones...and then to proliferate. I don't live in the boonies. I live in suburban Houston in a community near a major highway, and yet four or five areas where I live get no AT&T service at all. I could almost understand if the signal decreased, or if it switched from 3G to the older Edge network in places, but in 2012, in an affluent suburb near a highway, there is no excuse for a company like AT&T to have any area where my phone displays "No Service." Even with the growing dead-zone epidemic, I was reluctant to switch. I was wary of the illusory "grass is greener" effect; and at least with AT&T, I knew what I was getting. That is, until I moved. I moved only 4 miles, and I am still in the same community as before. But in my new house, the AT&T signal was too flaky and unreliable. I had to walk to special places in the house to get a workable signal, and even then the person at the other end of the line would constantly tell me that I was "breaking up." I often missed calls because, in the absence of a signal, my phone wouldn't ring at all. I wouldn't realize that I anyone had called until I received the voicemail. When we moved, we decided to eliminate the home phone and rely on our mobile phones. When I am away from home, I need to be able to reliably reach my children. In an emergency, we need to be able to contact help. Flaky service in my home is not an option. AT&T has a solution that would have worked. It offers a 3G microcell that boosts the 3G signal locally in your home, and routes the calls over your broadband connection. The problem is that AT&T expected me to pay $200 for the device. I talked them down to $100, but the company would still impose an ongoing fee for the 3G microcell service. AT&T could have kept me happy, but chose to let me leave instead. So let me get this straight. AT&T isn't capable of delivering the service I am already paying for, and the proposed solution is that I spend $200 (or $100 after a lengthy and heated debate), plus additional money every month for the privilege of routing my calls over the broadband Internet service I am also paying for? That was really the last straw for me with AT&T. Verizon is significantly better...for me. Don't get me wrong, I still maintain that the general AT&T bashing is unwarranted, and I am sure I can find places where the Verizon signal is weak, and AT&T is rocking five bars. Choosing a wireless provider is a function of the plans and services offered, but it is largely dictated by which provider has the best signal in the areas you need to use your device. For me, that seems to be Verizon right now. The real problem with wireless providers is the lack of flexibility or customer care. Perhaps the company is concerned about setting a costly precedent, but in my opinion AT&T should have given me the 3G microcell and waived the monthly microcell charges. I was a longtime customer, and providing 3G microcell service would have enabled AT&T to uphold its end of our contractual agreement by actually providing reliable service. Instead, AT&T alienated me and lost a customer. The problem is not unique to AT&T or even to wireless providers, but I think that companies should examine the issue more closely. The idea that it is cheaper to keep customers than to attract new ones has long been a business axiom, but these companies don't seem interested in listening to customers, or being flexible in any way. It's their way or the highway, and many people choose the highway.